Insider: Audemars Piguet Royal Oak Offshore Diver Silver-Toned Dial ref. 15710ST. After More Than a Month on the Wrist, the Black Dial is the Way to Go. The Audemars Piguet Royal Oak Offshore Diver was originally launched in 2012 under reference 15703ST.OO.A002CA.01 and it quickly became a favorite amongst many AP collectors. Not only the AP Diver was yet another milestone in the evolution of the Royal Oak Offshore collection, but it also established itself as the new entry level watch —regardless of being priced higher than the Royal Oak 15400ST— for those wanting to get their feet wet for the very first time in the AP waters. Three years later in 2015, Audemars Piguet refreshed this reference with a display case back and added a silver-toned dial as a second option under ref. 15710ST.OO.A002CA.02. After reference 15703ST with solid case back was discontinued, other iterations of the AP Diver were released in the following years including the model we have here, the AP Royal Oak Offshore Diver Chrono line and a very colorful lineup of AP Divers in lime green, yellow, orange, white and blue. You can read about those references right here. Since we have a soft spot for AP Divers and we owned reference 15703ST as soon as it came out, we were always curious as to how much we would like to own the silver-toned dial version and we decided to buy one a little bit over a month ago. After a month and two weeks of ownership and almost full daily wear, here are our impressions on the silver-toned dial versus the black one. The case diameter is 42 mm like on all other Royal Oak Offshore Divers and the only difference is that reference 15710ST is fitted with a display case back with sapphire crystal versus a solid case back on the discontinued reference 15703ST. Regardless of this difference in case construction, the total weight on the discontinued reference 15703ST.OO.A002CA.01 and reference 15710ST.OO.A002CA.02 is almost the same, with the latter being 4 grams lighter with a total weight of 166 grams versus 170 grams of the first one. Another major difference between the new reference 15710ST —especially on late H-serials as well as I and J-serials— and the earlier reference 15703ST, is that the rubber clad crowns are much softer to the touch and more 'rubbery' on the newer models as AP changed the composite of the elastomer utilized on the crowns of the Royal Oak Offshore collection towards the end of H-serials. As far as the crown at 10 o'clock goes, this crown is used to operate the inner rotating flange. In order to rotate the inner flange, you need to unscrew the crown first and then rotate it clockwise. The watch is truly a diving watch that meets the requirements of the ISO 6425 Standards for Diving Watches and is water resistant to 300 meters. One question that is frequently asked around different watch fora and that hasn't been properly addressed by AP —or anyone else until now—, is if this crown at 10 o'clock can be operated underwater or not. As far as we know, the crown needs to be screwed back in before immersion in the water and cannot be operated underwater. 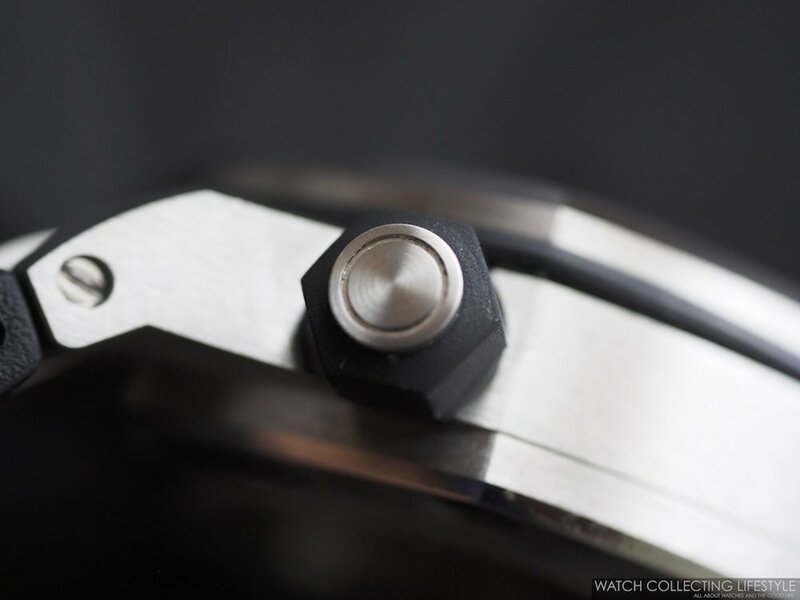 However, in our experience, after inadvertently leaving the crown unscrewed and swimming in the pool, no water entered the case —we are not making any claims as to whether you can or cannot swim with your watch with the crown unscrewed and avoid damaging it. While the dial maintains the same 'Méga Tapisserie' pattern with white gold applied hour markers and hands with luminescent coating and a inner rotating flange with diving scale that is also luminous, the dial is more subtle looking and more matte finished. While the silver-toned dial is much more versatile and less 'harsh' than the black dial, there are a few things we completely dislike and are worth pointing out. Without a doubt, the biggest flaw of the silver-toned dial model is the lack of anti-reflective coating on the date loupe. Additionally, the calendar font is much thinner than that on black calendar wheels, making it almost impossible to read the date under bright lighting conditions. As far as readability, the use of a black minute hand and an hour hand with black luminescent coating makes it quite challenging to read the time underwater. Then comes the poor luminescent material utilized by AP. While the lume on the black dial models is not perfect either, it is much brighter as this luminescent coating is white, while the luminescent material on the silver-toned dial is black and simply awful. If you are a crazy 'lume lover' like us, you will be completely disappointed. The picture below, was taken after exposing the dial to a UV lamp for more than five minutes and within 20 seconds, the lume would be so weak that it was almost impossible to get a proper shot. Lastly, the font utilized for the 'Swiss Made' designation at the bottom of the dial at 6 o'clock is less appealing as AP decided to switch to a Serif typeface, while the black dial reference 15703ST utilized a Sans Serif that was much cleaner and more visually appealing. The reference 15710ST we are reviewing here is powered by the same in-house automatic caliber 3120 powering references 15400, 15300 and the previous generation of Royal Oak Offshore Divers ref. 15703ST. Fortunately with the release of reference 15710ST, the movement was improved in order to correct some of the known issues of this calibre that included problems with the calendar not changing properly or the winding crown not engaging at times —thus not allowing the wearer to set the time. This movement with a 60-hour power reserve, continues to be one of the nicest movements out there and a very accurate one. 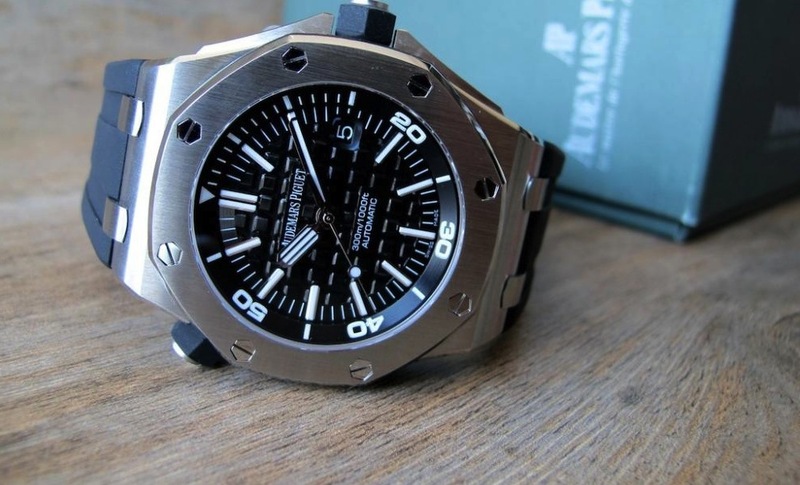 On the wrist, the Audemars Piguet Royal Oak Offshore Diver Silver-Toned Dial ref. 15710ST.OO.A002CA.02 wears slightly larger than the black dial model —optically because it's white. While the case diameter is 42 mm like on the Royal Oak Offshore Chronographs, the Royal Oak Offshore Diver wears much bigger as it has a slightly flatter bezel and a dial that is 1 mm wider than that on the Royal Oak Offshore Chronographs. The watch is fitted with the same grainy black rubber strap with tang buckle in stainless steel as the black dial mode. 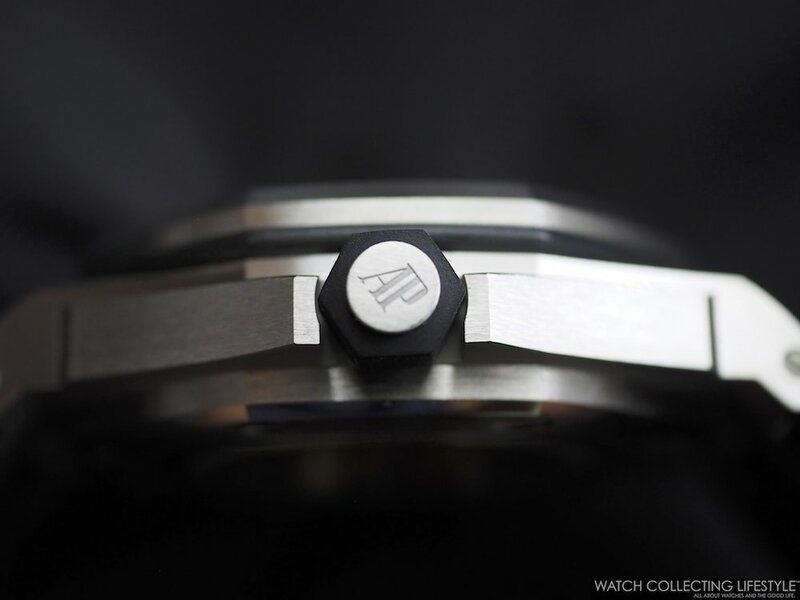 One other thing we noticed, is that the back of the buckle remains sandblast finished but instead of having 'AP' and 'ACIER INOX' engravings like the previous generation of AP Divers, it now only features an 'ACIER INOX' engraving. Overall, the watch is impeccably finished and perfectly suited for year-round wear; however, after owning the black dial model, we feel that the silver-toned dial falls short for those of us that want a more 'professional diver' look. Sticker Price $19,000 USD. For more info on Audemars Piguet click here. Posted on October 12, 2017 by Editor & Publisher and filed under Audemars Piguet and tagged Audemars Piguet Royal Oak Offshore Diver ref. 15710 Royal Oak Offshore Diver Silver-Tone White Dial 2017 Diving Watches Audemars Piguet AP Diver Audemars Piguet ROO Diver Audemars Piguet ref. 15710ST.OO.A002CA.02 Most Popular.